Located in Madrid, Spain, Almudena Cathedral is a historic Catholic church facility that serves as the seat of the city’s Roman Catholic Archdiocese, offering self-guided tours, a public museum facility, and weekly mass services. After the move of the Spanish capital from Toledo to Madrid in 1561, the new capital was left without a cathedral facility, as the seat of the Catholic church remained in the former capital city. Plans for a new cathedral facility, which would honor the Virgin of Almudena, were proposed as early as the 16th century but were delayed several times due to costs associated with the expansion of the Spanish Empire throughout North America. In the 19th century, the construction of a cathedral in Madrid became a priority for Spain, as the country’s government was determined to develop the largest and grandest cathedral facility ever constructed. The cathedral was to be designed according to the Gothic style of architecture by architect Francisco de Cubas, the Marquis of Cubas. Construction on the cathedral began in 1879 on the site of a former Medieval mosque destroyed in 1083 following the reconquering of Madrid by Alfonso VI. Though construction progressed throughout the beginning of the 20th century, it was halted due to the Spanish Civil War in the 1930s and was abandoned until 1950, when construction plans were picked up by Fernando Chueca Goitia and adapted to include a baroque exterior mirroring the adjacent Palacio Real. The cathedral’s cloister was completed in 1955 and its main facade in 1960. In 1993, the cathedral was finished and consecrated by Pope John Paul II. In 2004, the cathedral served as the site of the marriage of Spain’s King Felipe VI and Queen Letizia Ortiz Rocasolano. 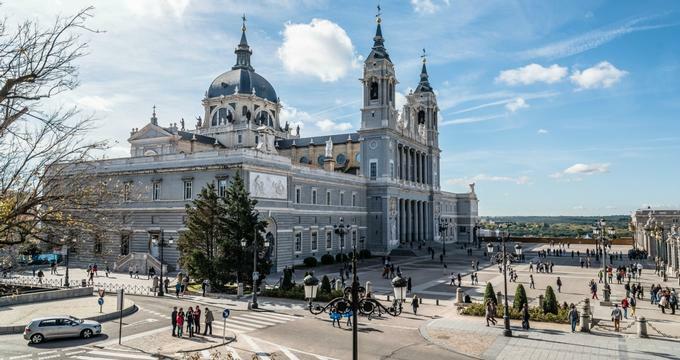 Today, Almudena Cathedral is located adjacent to Madrid’s Palacio Real and serves as the Spanish capital’s largest and grandest church facility. Weekly Sunday masses are held at the church at 10:30, 12:00, 13:30 and 19:00, with all services presented in Spanish. Visitors may also explore the cathedral as part of self-guided tours throughout daily operating hours. The cathedral measures 104 meters long by 76 meters wide and is oriented in a unique north-to-south orientation to align with the Palacio Real complex. It is noted for its modern beauty and unique design, which features a Neo-Gothic interior design, pop art stained-glass windows, and colorful ceiling art. The cathedral’s Neo-Romanesque crypt, its oldest section, was constructed in the 19th century and showcases an image of the Virgin of Almudena dating back to the 16th century. Its chapterhouse and vestry are adorned with mosaics created by Slovenian priest P. Marko I. Rupnik and contains a number of significant historical artifacts related to the origin and history of the Catholic church in Spain, including a codex by Juan Diácono which details the life and miracles of San Isidro Labrador. Bronze doors flank the Calle Bailén entrance, which was designed by sculptor Sanguino and depicts the discovery of the image of the Virgin of Almudena. The cathedral’s most prominent feature is its massive dome, which measures 20 meters in diameter and is colored gray due to the slate sheeting of the cathedral’s roof. 12 statues are located around the dome, depicting each of Christ’s apostles. The dome stands at a height of more than 70 meters and offers weather-permitting platform rooftop access for panoramic views of nearby attractions, including the Palacio Real, the Plaza de Oriente, and the basilica of San Francisco el Grande. A museum is offered within the cathedral, detailing the history of the Catholic church in Spain and the evolution of the Roman Catholic Archdiocese of Madrid. 12 halls showcase mosaics, Episcopal emblems, and vestments, along with a number of items connected to the history of the Diocese. Effigies of the city’s patron saints, San Isidro Labrador, and the Virgin Mary of la Almudena, are also showcased. The Almudena Cathedral is incorporated as part of the complex of the Palacio Real, which serves as the official residence of the Spanish royal family, though it is only used for formal ceremonies today, as King Felipe VI and his family reside at the Palace of Zarzuela. The palace, which was inspired by sketches by Bernini used in the design of Paris’ Louvre museum, showcases more than 3,000 rooms, including a main staircase designed by Sabatini, a Throne Hall with a ceiling display painted by Tiepolo, and a Royal Chapel, which houses a collection of authentic Stradivari stringed instruments. Other notable attractions within the palace include the Royal Armoury, one of the most significant collections of historic European armor, a Painting Gallery featuring prominent artworks by Goya, Velázquez, Caravaggio, and Sorolla, and the Real Cocina kitchen, one of the most intact preserved historic kitchens of any royal European residence. Visitors may observe the bi-weekly changing of the guard on Wednesdays and Saturdays, weather-permitting. Nearby, the Plaza de Oriente historic city square serves as Madrid’s city center, designed in 1844 by Narciso Pascual y Colomer and showcasing more than 20 historic sculptures of Spanish monarchs.